Born in Ghana, Prince Mensah has twenty-five stage plays to his credit. Some of them have been acted at the Accra Arts Center and at several locations in Accra. 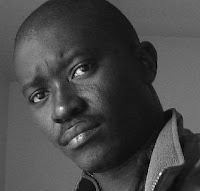 His articles and stories have been published in the STEP magazine, P & P, Ghanadot.com and The Free Press. His poetry has been published in the Munyori Journal, UNESCO's Other Voices International Project, The Muse Literary Magazine and the Dublin Writer's Workshop. Prince Mensah has published seventeen books of poetry. They are Memoirs of A Native Son, I Shall, I Will, I Can (Poetry Inspired by Barack Obama), Afrocentric, ecclesiastes, State of An Abstract Mind, The Griot Metropolitan, The Land of Broken Mirrors, Coronation, Enough is Enough, World War-Free, in praise of the calabash, Prophylaxis, Via Dolorosa, Tabula Rasa, Eclectic, Situational Hazard and Chronology. Prince is a Consultant in Workplace Mediation, an HIV/AID Treatment Advocate and an Eligible Translator/Interpreter in Twi & Fante for the Judicial Consortium of 40 American States. He lives in the United States with his wife, Charisse. Prince is the head of North American promotions for One Ghana, One Voice. 1. What inspired you to write about Zimbabwe? Was the writing of your poem a response to our submission call, or was the poem already written? It was OGOV’s call for submissions that prompted the creation of this poem. After doing some research on Zimbabwe’s glorious past and volatile present, I realized how important it was to stoke the greatness lying latent in this country. 2. How do you think we, as outsiders, can help with the current political struggles in Zimbabwe? Should we be involved? I think, as outsiders, we can only hold the mirrors of opinion and reflect back to Zimbabwe what it represents to us. President Mugabe gives me great ambivalence. On one end, I am proud he is taking shots from nobody. On the other hand, I am disappointed that he is not employing all the brilliant Zimbabwean minds to build the country. I don’t think all the answers to Zimbabwe’s troubles are in his head. For the sake of the Zimbabwe that he risked his life for, he must give way to ideas that will move the country forward, not backward. Ghana’s first president, Kwame Nkrumah was the biggest African bankroller for Zimbabwean independence. He believed in the Zimbabwean dream. Robert Mugabe’s first wife, Sally, (who is now deceased) was Ghanaian from Cape Coast. He was once a lecturer at University of Ghana. There is an endearing history between Ghana and Zimbabwe, which can be used in several ways to nudge the present government to do the right thing. An epic struggle continues between the old guards who shed their sweat and blood for independence and the modernists who want to open Zimbabwe to more western ideas. In the end, the struggle for power is a Shakespearean tragedy reenacted in varying forms in African countries. 3. What impact do you think our writing about Zimbabwe can have on the current's current political/economic state, if any? Zimbabweans have the highest literacy rate in Africa so I know that our writings will find their way to discerning minds who can utilize the sentiments expressed in the poems. That being said, if there is a way to post photos from Zimbabwe to accompany the poems, it would be helpful. 4. What lessons can Zimbabwe learn from Ghana's history? What lessons can Ghana learn from Zimbabwe? Zimbabweans can learn the power of tolerance from Ghana. Trust me; we have had volatile situations that could have ended up in chaos. Yet, there is a cultural underpinning that rejects bloodshed as a way of solving issues. The way of Gandhi is better than the way of guns. In the end, the best person to change Zimbabwe for the better is the Zimbabwean who is ready to make sacrifices and take risks, in order to move the dream forward. Ghanaians can learn the value of higher education from Zimbabweans. Getting either a Masters Degree or Doctorate is a rite of passage for Zimbabweans. This enables them to excel in and out of their country, enabling them to garner the experience and expertise to contribute to nation building. I do not mean that holding a graduate degree is the panacea to our problems. However, it opens up possibilities for the individual in a country where opportunities are few. 5. Your poem focuses on the history of Zimbabwe. What lessons can we learn from that history to help effect the present? As one of the earliest kingdoms in continental Africa, Zimbabwe stands for enduring cultural heritage and identity. With centuries of military, political and religious development, the psyche of pre-colonial Zimbabwe was a precursor to the anti-colonial sentiment that surged through Africa through 1960s – 1980s. The lessons that can be learned from the past involve the ability to avoid self-destructive traits and to use whatever helps the Zimbabwean dream to be realized. I trust that President Mugabe and Prime Minister Tsvangirai can work together as fellow Zimbabweans to attack the demons of conflict and power-grabs. In the end, Zimbabwe must not become a victim of vitriol, vanity and vendetta. It deserves better than that.